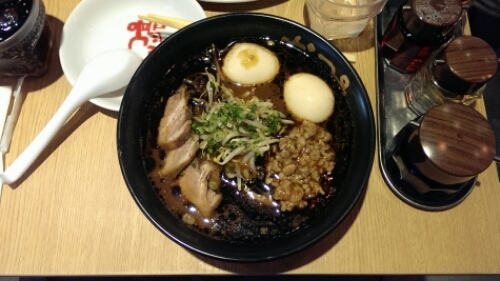 Ramen | Get Your Grub On! It was the last weekend of Wiesn in Munich and I went back to the beer tents at freaking 7:30 a.m. in the morning to meet my friend from Hong Kong and her hilarious entourage from Spain, Belgium, Ireland and England, from whom most had never been to the Oktoberfest before; no reservations, no choice. After a bit over an hour wait, we actually made it into the Augustiner beer tent and…well let’s just fast forward for a couple of hours and a few emptied stones. Our little group split up; some went missing, some went home and a few continued on their german beer quest. I, even though ready for an extended nap on the couch, made a little detour to my favourite ramen shop in Germany to date, Takumi in Maxvorstadt, just a little train ride away. I was obviously lucky today, unlike on other occasions, as the place was actually open and no waiting in the queue either. I sat down and ordered my favorite, the Tantanmen. I have tried others, but so far no bowl could beat that red and rich, spicy broth. Portions are huge here and I was a bit overwhelmed when the piping hot bowl showed up, doubting I could actually finish it, I was wrong. The broth was awesome, savoury and spicy, thick and rich, loaded with peanut and sesame flavors and loads of that deliciously spiced minced meat. I absolutely loved it. Now let me talk about those noodles; I do come here almost everytime I’m in town, but these were hands down the best ones, they’ve ever made for me. Maybe because the place was not as packed as usual, maybe they improved generally or I was just darn lucky, but these noodles were very very close to perfect. Speaking pasta terms, they were absolutely on spot al dente, chewy and with this unique texture, that only ramen noodles have. Not that they have ever been really bad before but more often than not, they were a little on the softer side. Not stopping there, even the eggs went through some sort of evolution here and seemed more beautifully waxy than ever. So awesome guys, keep it up. Service here has always been super nice and everybody is offering you smiles and it was exactly the same today. Staff is friendly and service is pretty fast and efficient. If I would need to pick on something negative it would be the fact that your ordinary ice tea here comes by the glass for EUR1,80, which gets quite pricey if you (like I) tend to drink loads while eating big bowls of hot soup. In the end, it’s just water, so I would rather pay a bit more for a free flow of my jasmine tea rather than order over and over again, but maybe that’s just me being used to free flow tea and water in these kinda places. Other than this little blemish, I totally love it here and see no reason why not to come back again and again and again.